Runnymede Healthcare Centre is having a Community Meeting to discuss a proposal to build a 200-bed long-term care home adjacent to their existing facility. Come out, see what they are proposing, and take part in the discussion. Glen Downie won the Toronto Book Award for his verse poetry collection Loyalty Management. He has also published prose poems (Local news, Left for Right), found poems (Monkey Soap) and a collection of prose poems and found images (Democratic Beauties). He labours under the delusion that every month is poetry month. Drop in. No registeration required. First come, first served. Police shooting. Pursuit that ends in a motor vehicle collision. Use of force during a struggle and arrest. If any of these incidents ends with serious injury or death, the Special Investigations Unit (SIU) starts an investigation to determine if the officers involved acted criminally. As part of these investigations, the SIU assigns and dispatches forensic investigators, who measure, photograph, collect, and analyze evidence from the scenes of these incidents. A member of the SIU will explain the science behind investigations, how evidence is collected and what can be learned from what’s collected. Presented as part of Toronto Public Library’s Civil Society program series. Zalika Reid-Benta, Frying Plantain which publishes on June 4, 2019. George Elliot Clark has called Zalika Reid-Benta “a writer to watch”. Frying Plantain is a rich and unforgettable portrait of growing up between worlds. Zalika Reid-Benta artfully depicts the tensions between mothers and daughters, second-generation Canadians and first-generation cultural expectations. 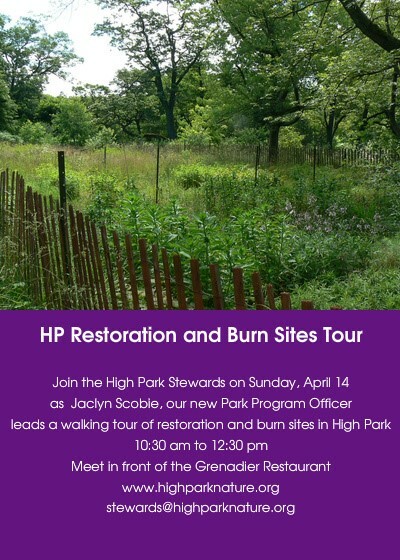 On April 14 at 10:30 am join High Park Stewards for a walking tour of our Restoration sites and a discussion of prescribed burns as a habitat management tool led by Jaclyn Scobie, Park Program Officer, Urban Forestry. Meet in front of the Grenadier Restaurant (200 Parkside Drive). The City of Toronto’s Special Committee on Governance will hold its second meeting at 9:30 a.m. on April 12, in Committee Room 1 at City Hall. Members of the public are invited to attend. At this meeting, Professor Gabriel Eidelman, Director of the Urban Policy Lab at the Munk School of Global Affairs and Public Policy, will present findings from the University of Toronto’s 2017 City Hall Task Force, which made recommendations to improve City Council’s core decision-making processes and procedures. A staff report will recommend a work plan for the committee and a public engagement strategy for the coming year. The report also includes a summary of the public input the committee received on the City’s governance structure, and preliminary research at its first meeting on February 21. The Special Committee on Governance was established by City Council with a mandate to consider the impacts on the City’s governance structure and processes arising from the reduced size of Council and to make recommendations to City Council on any further changes to its governance structure.